Figure 1 • Goals for high performance 5G. To support 5G, the range of mobile communication frequencies will be extended to include new spectrum allocations below 6GHz, as well as higher frequency bands that will complement the lower bands by providing additional system capacity and very wide transmission bandwidths on the order of 1GHz or more for bands above 30GHz. These higher frequency ranges will provide the very wide bandwidths necessary for extreme data rates in dense deployments. However, since frequencies above 30GHz have inferior propagation properties (higher loss), the lower bands will be more commonly used, serving as the backbone for 5G mobile-communication networks. 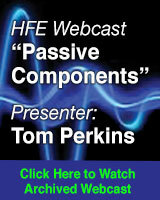 The higher mm-wave frequencies will present a number of new challenges to the circuit designer. In addition to the much higher propagation losses from 30 GHz to 70+ GHz, the active devices in power amplifiers (PAs) typically have much lower gains than at lower frequencies and may not perform as well. While devices based on GaN and switching mode PAs for high efficiency will proliferate at the lower bands, mmWave PAs will likely be developed using silicon germanium (SiGe) bipolar complementary-metal-oxide semiconductor (BiCMOS) technologies. Wideband PAs that provide sufficient linearity and efficiency for any of these semiconductor technologies will likely come at the cost of complexity in the circuit architecture, employing envelope tracking, digital pre-distortion, or any number of schemes. In addition, there are also challenges associated with sufficiently broadband impedance matching network as well as moving from traditional lumped-element to distributed element designs, where the electrical response of the layout plays a critical role in overall circuit performance. If the design needs some rework, it will no longer be as simple as swapping out components--designers will have to rethink the entire layout of the design. It will be more difficult to fix issues once the device comes back from tape-out. As a result, much more analysis, including full chip/board modeling via EM simulation will need to be done up front, prior to sending devices out for prototyping. Front-end device design will also need to be supportive of the new modulation techniques being considered for 5G. While orthogonal frequency-division multiplexing (OFDM) has worked well for 4G, the advances in processing capabilities that will be available by 2020 when 5G is expected has system designers considering other waveforms that may offer a number of advantages. Whereas OFDM requires the use of a cyclic prefix (CP) which occupies space within the data streams, modulations based on filter-bank multicarrier (FBMC) does not have a cyclic prefix and as a result it is able to provide higher levels of spectral efficiency. Instead of filtering the whole band as in the case of OFDM, FBMC filters each subcarrier individually. The subcarrier filters are very narrow and require long filter time constants, typically four times that of the basic multicarrier symbol length and as a result, single symbols overlap in time. To achieve orthogonality, offset-quadrature amplitude modulation (QAM) is used as the modulation scheme, so FBMC is not orthogonal with respect to the complex plane. Another 5G waveform under consideration is universal filtered multicarrier (UFMC), which is an enhancement of CP OFDM. It differs from FBMC in that instead of filtering each subcarrier individually, UFMC splits the signal into a number of sub-bands, which it then filters. UFMC does not have to use a CP, although one can be used to improve the inter-symbol interference protection. With filtered OFDM (f-OFDM), the bandwidth available for the channel on which the signal is to be transmitted is split up into several sub-bands. Different types of services are accommodated in different sub-bands with the most suitable waveform and numerology. Generalized frequency-division multiplexing (GFDM) is a flexible multi-carrier transmission technique similar to OFDM except the carriers are not orthogonal to each other. 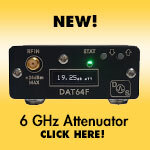 GFDM provides lower the out-of-band emissions, resulting in lower interference levels between adjacent signals. A comparison of spectral regrowth of OFDM, FBMC, and GFDM is shown in Figure 2. It can be easily observed that all the proposed modulation schemes provide better spectral properties; however, it is worth noting that this is achieved at the expense of more complex algorithms required in the respective receivers. 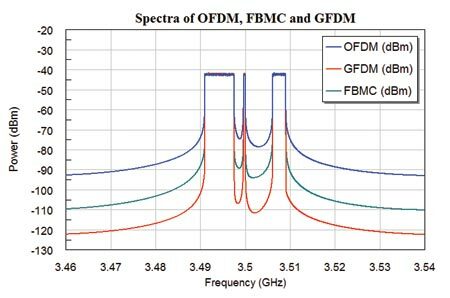 Figure 2 • Spectra of OFDM, FBMC, and GFCM signals with partial subcarrier loading. While these advanced modulation schemes being considered for 5G offer certain system-level advantages, they are more sensitive to nonlinearities and potential adverse effects of real-world designs. Designers will no longer be able to consider the modulation schemes separately, they must be analyzed in the presence of the RF links to understand how the overall system will perform when the device is pushed to compression or near-compression. These new 5G modulation schemes will be supported in the upcoming release of NI AWR Design Environment, specifically Visual System Simulator™ (VSS) system design software. The NI AWR software platform enables seamless co-simulation between the VSS system simulator and the Microwave Office circuit simulator so that circuit designs can be optimized to meet the required system metrics. VSS also provides co-simulation with third-party tools such as MATLAB, Simulink, LabVIEW, C++, and fixed-point simulations, as well as hardware-in-the-loop simulations. Most importantly, designs created in VSS enables designers to perform these functions within a single environment, providing them with the opportunity to combine highly detailed component performance information within a complete end-to-end system simulation as more detailed information becomes available. This provides highly reliable simulation data and greater insight into the impact of individual component behavior, as well as component-to-component interaction. The RF budget analysis feature in VSS is well suited for 5G systems, offering powerful capabilities that go beyond traditional spreadsheets. In addition, the spur analysis enables designers to find the root cause and heritage of spurs at various points in an RF link in order to avoid unwanted spurious tones arising from device nonlinearity. The time-domain end-to-end simulations enable designers to measure system-level quantities such as bit error rate (BER), error vector magnitude (EVM), and adjacent channel power ratio (ACPR). Massive multiple input/multiple output (MIMO) and beamforming signal processing are expected to play critical roles in 5G as they greatly enhance coverage and user experience across the whole range of frequency bands. 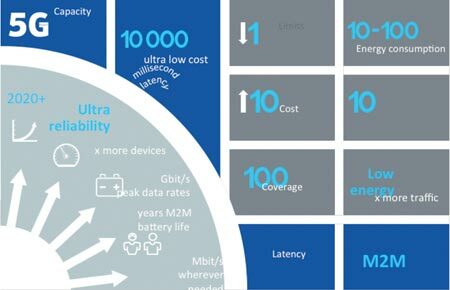 “Massive MIMO” is a term coined by the 5G community to describe antennas with many elements (up to 128), which will contribute significantly to the required 5G capacity increase. Massive MIMO will employ beamforming technology, which will then enable 5G systems to pinpoint and steer the signals to specific users and track these users so they always have good coverage. It will also enable simplified receivers on the user equipment side. Another benefit offered by beamforming is the ability to transmit considerably less power due to the array gain, which in turn results in certain reductions in hardware complexity. For example, the power amplifiers and supporting circuitry in a traditional base station dominate power consumption at about 1 kW for three sectors because of their need to provide high-RF output power and their low efficiency when operating at considerable back off to achieve linearity requirements . In Massive MIMO a similar range can be covered with a total power consumption of 15 W for 100 antennas. Massive MIMO also helps counteract the impact of the higher propagation losses at mmWave frequencies by directing energy more efficiently over the channel. In addition, beamforming improves the radio environment by limiting interference to small fractions of the entire space around a transmitter and likewise limiting the impact of interference on a receiver to infrequent stochastic events. The use of beamforming will also be an important technology for lower frequencies; for example, to extend coverage and to provide higher data rates in sparse deployments. Another goal is to provide within the MIMO technology itself spatial-multiplexing capabilities that increase user throughput. By using arrays with hundreds of antennas at the base stations, which simultaneously serve many tens of low-complexity terminals in the same time frequency resource through closed-loop spatial multiplexing/de-multiplexing (multi-user MIMO precoding/decoding), a 10x or more increase in gross throughput can be achieved with Massive MIMO. Perhaps even more important is the significant gain in reliability due to flattening out of deep fades, hardening of the channel, and array gain . In order to cope with moving terminals, the base station employing beamforming must be able to track the terminal and adaptively steer its beam into the direction of the terminal. 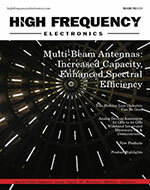 Such adaptive beamforming can be implemented with phased array antennas. A phased-array antenna consists of various interconnected individual transmitters. With a variable and intelligent arrangement of the individual transmitters, the resulting antenna pattern achieves high directivity and the resulting beam can be flexibly adjusted to moving users and varying capacity needs. Achieving the goals for Massive MIMO poses several unique design challenges. Any large antenna system, and especially a MIMO system, is complex to design and difficult to analyze. As communications systems move to higher and higher frequencies, RF impairments become ever more significant. MIMO system modeling includes antenna elements in the phased array as well as the RF links of the individual elements. Since each element has its own RF links in MIMO, it is important to include the RF link impairments in the overall performance of the antenna so that meaningful results are obtained that are close to the final measured results of the device once it is built. The effects of the specific RF links for each of the elements in the antenna pattern of the overall system need to be investigated. This design process will also define the matching network requirements for the system. New phased-array modeling capabilities in NI AWR Design Environment, specifically VSS, provide ease of configuration and reduced overhead, as well as shorter design and simulation times. These capabilities enable designers to configure the array’s geometry using either a standard layout pattern or a custom-created one. The radiation patterns of individual elements can be specified via simulations or real-world measurements and can be included in the performance evaluation of the phased array. Such an approach yields much more accurate results compared to simple, idealized, isotropic sources. Furthermore, the system simulator can model the individual RF components in the phased array so that designers can obtain a realistic performance of the overall system. The following example demonstrates these new capabilities in the design of a 4X4 phased-array antenna. This example examines a base-station MIMO. There is a source, which goes to a transmitter phased array, then to a channel, and then to a receiver antenna. Looking at the transmitter phased array in Figure 3, it can be seen that it is a simple 4X4 phased array containing 16 elements. Each of the elements has its own RF link. One of the challenges of designing systems is the impedance matching between the power amplifier and the antenna. Figure 3 • One of the challenges of designing systems is the impedance matching between the power amplifier and the antenna. While traditional approaches may be sufficient for smaller phased arrays, larger, more complex arrays require significantly more processing time and power. The new phased-array functionality in VSS enables the design and analysis of very large phased arrays with thousands of elements and facilitates the implementation of various array geometries, tapers, imperfections, and degradation. VSS offers enhanced modeling of element radiation patterns and mutual coupling, as well as characterization of RF links for individual array elements. It is well known that the impedance mismatch between the PAs and their corresponding antenna element varies based on the scan angle of the array. In this example, the designer investigated the impedance mismatch between the power amplifier and the antenna by setting a range of impedance values on a Smith chart and then using VSS to evaluate the performance of the design over the range of impedance values. Different measurements were run and evaluated, and from the measurements the requirements were drawn for the matching networks (Figure 4). A simple 4X4 rectangular array with λ/2 element spacing was used for the phased-array configuration in this case, with a Dolph-Chebyshev gain taper and patch elements for the antenna array elements. The blue curve on the left in Figure 5 shows the array response when there is perfect matching between the PA and the antenna elements. The graph on the right in Figure 4 shows results for each of the impedance points on the Smith chart from Figure 4. It can be seen that there is a wide variation in mismatch effects. Both the main lobe and side lobes change significantly in terms of main lobe gain, beam width, and side lobe suppression. One quantity that can be calculated is the antenna array response; however, much more can be gleaned through system-level measurements. The same system can be driven with modulated signals, system-level measurements for EVM, ACPR, and more can be performed, and measurement contours can be plotted on a Smith chart. The performance of matching networks can be investigated and these system-level measurements can be used to derive the requirements for these matching networks, Figure 6. Figure 6 • Along with antenna array response, system-level measurements can be taken from the same system. NI AWR Design Environment also offers an automated analysis flow, enabling users to define the system architecture (modulation and more), configure the antenna array, set up the RF links, define gamma or impedance points that will be used for analysis, configure desired measurements, and, finally, run the automated analysis. EVM and ACPR or other measurements are calculated. The results of the automated analysis are shown in Figure 7 with ACPR contours are on the left and EVM contours on the right. The measurement contours are plotted on a Smith chart, and regions where the requirements are met are identified, giving the definitions for the matching networks. The designer is now able to go back and intelligently design the matching networks, ensuring that the overall system will perform well. Figure 7 • Results of the automated analysis with ACPR contours on the left and EVM contours on the right. This article describes the emerging technologies being developed for 5G communications and new modulation schemes being considered for 5G and highlights the simulation capabilities in VSS that help designers overcome the associated design challenges. An example demonstrates the design of a simple phased-array antenna using new advances in phased-array design and analysis and highlights the ability to capture the real-world interactions that occur between phased-array antennas and their driving circuitry. While the antenna example is simple, there was a large amount of processing and analysis behind the final design. The capabilities in VSS enable users to design very large phased arrays and simplify array design and configuration. It includes element radiation patterns for individual elements and mutual coupling, as well as the RF model links for individual array elements. VSS enables designers to evaluate the effects of matching networks in overall system performance, including array response and system-level measurements that will be used for evaluating the overall system. Automated analysis enables users to quickly configure a complex 5G system for particular requirements and obtain results in a short amount of time in order to follow up with further design work. Gent Paparisto is Product Manager, RF Systems, at AWR Group, NI. Emil Björnson, Erik G. Larsson, Mérouane Debbah, “Massive MIMO for Maximal Spectral Efficiency: How Many Users and Pilots Should Be Allocated?,” IEEE Transactions on Wireless Communications, 2016.